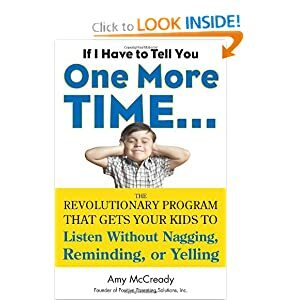 First and foremost, this book saves natural/logical consequences and choices as a “plan b” after you have already tried preventative strategies (which include: scheduling quality, kid-focused, one-on-one time throughout the day; actively teaching them exactly how to behave; etc.). It says that consequences should comprise only about 15 percent of your parenting solutions. The other 85 would be taken care of with preventative work. If I Have to Tell You makes a really great point that constantly telling your kids, “don’t do that!” is a REALLY ineffective way to teach them how to do something. Imagine how annoyed you’d be at work if your boss expected you to do something, but didn't tell you exactly what s/he wanted and instead, just kept sending your work back over and over again with annoyed and frustrated comments because you hadn't read her mind the first time around? Ugh, right? She talks about explicitly teaching (showing not just telling) skills in a low stress and fun way to obviate the need for this sort of ineffective and depressing nagging and correcting. She also sets up very clear boundaries for when and how to use natural consequences (i.e., you do nothing and let life teach your kid; e.g., you forgot your shin guards, mom won’t bring them and you have to sit soccer practice out) and logical consequences (i.e., it isn't safe or efficient to do nothing so you create the consequence; e.g., you won’t wear a helmet, you don’t get to ride your bike for a week – instead of you ride anyway and you might or might not get a traumatic brain injury). Natural consequences are the preference, but if they can’t be safely or efficiently carried out, then logical consequences would be appropriate. The consequences should be reasonable and respectful (so no staging your kid’s kidnapping, ahem PWL&L first edition), related (so starving your kids because they didn’t feed the dog seems like a stretch, again, PWL&L updated edition), and you should communicate them in advance and have the child repeat them back (so you are never surprising them with an outcome). The author also addresses a lot of my concerns with PWL&L. First and foremost, she says natural and logical consequences are not appropriate for kids under 30 months of age. For younger kids, she emphasizes her prevention strategies (quality time, active teaching, etc.). She talks about how inefficient telling things to kids can be (versus PWL&L’s obsession with verbose lectures) and instead emphasizes modeling, role playing, showing, and finally (as a last resort) giving consequences. She also says, the best consequences are immediate (the exact opposite of PWL&L’s bizarre assertion that a delayed consequence will somehow be more impactful because the kid thought they got away with it; in reality, they probably forgot about it and won’t know to associate the two actions). Overall, she just makes a more coherent, thoughtful, and nurturing strategy than PWL&L. I highly recommend If I Have to Tell You One More Time. I'll get into some of the details of it's suggestions in future posts. Including, the much anticipated (jokes! nobody is anticipating it, but I did promise it a long time ago) post on how I feel about incorporating meals into consequences. I have been looking forward to your review of this one. I am going to have to pick it up! It is REALLY good. There's even more than I could get to in this post, I don't think you'll be disappointed. at least, I really hope not, since I've hyped it so much.